شرعیات, محمد, عاقب, رویا. (1392). بررسی تحلیلی رفتار دینامیکی ورقهای هدفمند ویسکوالاستیک تحت بارهای عرضی با تغییرات زمانی دلخواه. نشریه پژوهشی مهندسی مکانیک ایران, 15(3), 52-72. محمد شرعیات; رویا عاقب. "بررسی تحلیلی رفتار دینامیکی ورقهای هدفمند ویسکوالاستیک تحت بارهای عرضی با تغییرات زمانی دلخواه". نشریه پژوهشی مهندسی مکانیک ایران, 15, 3, 1392, 52-72. شرعیات, محمد, عاقب, رویا. (1392). 'بررسی تحلیلی رفتار دینامیکی ورقهای هدفمند ویسکوالاستیک تحت بارهای عرضی با تغییرات زمانی دلخواه', نشریه پژوهشی مهندسی مکانیک ایران, 15(3), pp. 52-72. شرعیات, محمد, عاقب, رویا. بررسی تحلیلی رفتار دینامیکی ورقهای هدفمند ویسکوالاستیک تحت بارهای عرضی با تغییرات زمانی دلخواه. نشریه پژوهشی مهندسی مکانیک ایران, 1392; 15(3): 52-72. در مقاله کنونی، رفتار دینامیکی ورق ویسکوالاستیک هدفمند روی تکیه­گاه­های ساده، تحت بار عرضی با تغییرات زمانی دلخواه، به روش تحلیلی مورد بررسی قرار گرفته است. مدل انتگرالی توارثی برای توصیف رفتار ویسکوالاستیک مواد و تابع توانی برای توصیف تغییرات هدفمند ویژگیهای مواد در جهت عرضی استفاده شده­اند. برای یافتن پاسخ معادله دیفرانسیلی- انتگرالی حاکم بر ورق، حل مکانی ناویر و حل زمانی رانگ-کوتا با تبدیل انتگرال­های زمانی به شیوه ذوزنقه­ای استفاده شده است. اثر ویژگی­های مختلف مواد و پارامترهای هندسی بر تاریخچه زمانی پاسخ ورق، به طور گسترده بررسی شده­ است. نتایج نشان می­دهند که به دلیل ماهیت میراسازی مواد، در زمان­های ابتدایی سختی ورق افزایش و در نتیجه، خیز دینامیکی بیشینه ورق کاهش و فرکانس طبیعی آن افزایش می­یابد. Praveen, G., and Reddy, J. N., “Nonlinear Transient Thermoelastic Analysis of Functionally Graded Ceramic-metal Plates”, International Journal of Solids and Structures, Vol. 35, No. 33, pp. 4457-4476, (1998). Cederbaum, G., and Aboudi, J., ”Dynamic Rresponse of Viscoelastic Laminated Plates”, Journal of Sound and Vibration, Vol. 133, No. 2, pp. 225-238, (1989). Chen, T.M., “The Hybrid Laplace Transform/Finite Element Method Applied to the Quasi‐static and Dynamic Analysis of Viscoelastic Timoshenko Beams”, International Journal for Numerical Methods in Engineering, Vol. 38, No. 3, pp. 509-522, (1995). Ilyasov, M., and Aköz., A., “The Vibration and Dynamic Stability of Viscoelastic Plates”, International Journal of Engineering Science, Vol. 38, No. 6, pp. 695-714, (2000). Paulino, G.H., and Jin, Z.H., ‘‘Correspondence Principle in Viscoelastic Functionally Graded Materials”, ASME Journal of Applied Mechanics, Vol. 68, pp. 129–132, (2001). Paulino, G., and Jin, Z.H., “Viscoelastic Functionally Graded Materials Subjected to Antiplane Shear Fracture”, Journal of Applied Mechanics, Vol. 68, No. 2, pp. 284-293, (2001). Paulino, G. H., and Jin, Z. H.,”A Crack in a Viscoelastic Functionally Graded Material Layer Embedded Between Two Dissimilar Homogeneous Viscoelastic Layers–antiplane Shear Analysis”, International Journal of Fracture, Vol. 111, No. 3, pp. 283-303, (2001). Jin, Z.H., and Paulino, G. H, ‘‘A Viscoelastic Functionally Graded Strip Containing a Crack Subjected to In-plane Loading”, Engineering Fracture Mechanics, Vol. 69, pp. 1769–1790, (2002). Abdoun, F., Azrar, L., Daya, E.M., and Potier-Ferry, M., ”Forced Harmonic Response of Viscoelastic Structures by an Asymptotic Numerical Method”, Computers & Structures, Vol. 87, No. 1, pp. 91-100, (2009). Assie , A.E., Eltaher, M.A., and Mahmoud, F.F., “The Response of Viscoelastic-frictionless Bodies under Normal Impact”, International Journal of Mechanical Sciences, Vol. 52, No. 3, pp. 446-454, (2010). Assie, A.E., Eltaher, M.A., and Mahmoud, F.F., “Modeling of Viscoelastic Contact-impact Problems”, Applied Mathematical Modeling, Vol. 34, pp. 2336-2352, (2010). Assie, A.E., Eltaher, M.A., and Mahmoud, F.F., “Behavior of a Viscoelastic Composite Plates under Transient Load”, Journal of Mechanical Science and Technology, Vol. 25, No. 5, pp. 1129-1140, (2011). Altenbach, H., and Eremeyev, V.A., “On the Bending of Viscoelastic Plates Made of Polymer Foams”, Acta Mechanica, Vol. 204, No. 3- 4, pp. 137-154, (2009). Altenbach, H., and Eremeyev, V.A., “Analysis of the Viscoelastic Behavior of Plates Made of Functionally Graded Materials”, ZAMM‐Journal of Applied Mathematics and Mechanics/Zeitschrift für Angewandte Mathematik und Mechanik, Vol. 88, No. 5, pp. 332-341, (2008). Lakes, R.S., “Viscoelastic Materials”, Cambridge University Press, New York, (2009). Badalov, F.B., Eshmatov, K., and Akbarov, U.I., ”Stability of a Viscoelastic Plate under Dynamic Loading”, International Journal of Applied Mechanics, Vol. 27, No. 9, pp. 892-899, (1991). Ugural, A.C., “Stress in Plates and Shells,” McGraw- Hill, New York, (1999). Gerald, C.F., and Wheatley, P.O., “Applied Numerical Analysis,” 7th Edition, Pearson, California, (2003). Wang, Y., and Tsai, T., “Static and Dynamic Analysis of a Viscoelastic Plate by the Finite Element Method”, Applied Acoustics, Vol. 25, No. 2, pp. 77-94, (1988). 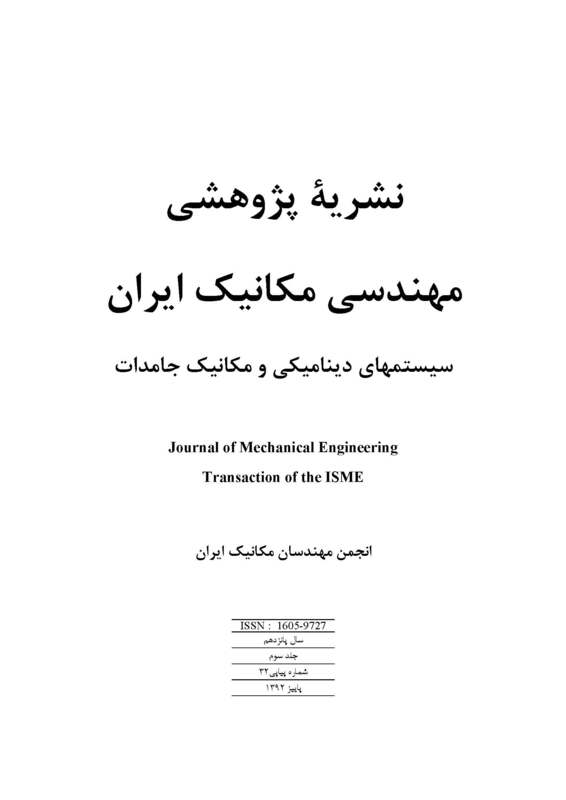 Shariyat, M., and Azadmanesh, M., “Thermal Buckling Analysis of Rectangular Composite Plates Subjected to Large Deflections, Based on a Layerwise Theory and Budiansky's Criterion Modification”, ISME Journal Vol. 9, No. 1, pp. 25-40, (2007).